Written in lively style this book is both informative and a quick read. 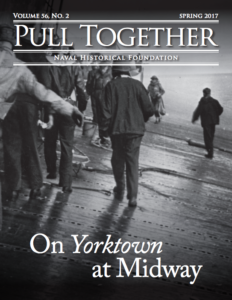 For most readers of Pull Together it will be a review of episodes in the early Navy, important to the history but all too easily forgotten. Names like Bainbridge, Barron, Chauncey, Dale, Decatur, Eaton, Hull, Morris, O’Bannon, Preble Somers, Sterrett and Stewart leap out of the pages. So too do John Adams and Thomas Jefferson and various North African potentates. For years, if not centuries, the rulers of Barbary, Morocco, Tunis, Algiers and Tripoli, had sustained their realms on the booty and ransom extracted from European, and more recently, American merchant ships. At first the young United States tried negotiation and even ransom payment but soon found the amounts demanded for captured ships were ever-increasing, exorbitant and unaffordable. The only alternative seemed to be war: defeat the robbers and eliminate the problem. As Kilmeade expertly describes, it wasn’t quite that easy, as it took a while to build, train and put into action an effective American force. Algerines had swarmed the American merchant ship Dauphin off the coast of Portugal as early as 1785. The crew was held captive and the ship taken to Algiers. Many remained captive under cruel conditions for ten years. After that, the United States tried tribute to keep the peace, albeit more than the young nation could afford. Thus, in 1800, USS George Washington under the command of William Bainbridge sailed into the Mediterranean carrying tribute to the dey of Algiers. When the proffered tribute was declared inadequate, the dey commandeered George Washington and ordered Bainbridge to set sail and carry his ambassador, his entourage and his own tribute to the emperor in Constantinople. Adding insult, the ship would be required to lower the American flag and hoist the Algerine pennant. Having trustingly moored his ship under the guns of the Algerine fort, Bainbridge had little choice. Thus the ignominy had to be suffered. Tripoli soon joined in the Barbary campaign of affronts. In 1801, the Bashaw declared war on the United States. Even while news of Tripoli’s declaration was wending its way to the United States a squadron of the Navy’s finest ships, three frigates and a schooner, set sail for the Mediterranean under the command of Richard Dale. Once in the Med they had little to show for their effort, save a victory in a one-on-one battle wherein Lieutenant Sterrett in Enterprise neatly handled a Tripolitan raider. When news of that victory reached the United States, President Jefferson used the success to leverage Congress into approving the use of force against the brigands of the Maghreb. Two years passed before there was any meaningful action, however. The American fleet in the Mediterranean had to first suffer through the incompetent leadership of Commodore Richard Morris, a sad commentary on naval assignment practices in the early Nineteenth Century. His replacement Richard Preble soon proved to be the polar opposite of the dilatory Morris. Despite his leadership, Preble soon ran into disaster. The frigate Philadelphia, on patrol near Tripoli giving chase to a group of Tripolitans trying to slip the blockade, ran aground. Kilmeade’s description of the sudden futility of trying to save Philadelphia and the horror of capture of ship and crew by Tripolitans racing from shore in itself is worth the read. Fearful that the Tripolitans would repair and turn Philadelphia against them, Preble quickly realized that possibility must be removed from the game. 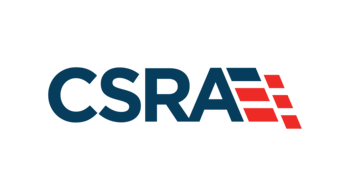 The story of the heroism of Stephen Decatur and Charles Stewart who accomplished that with a daring night raid has been told many times, but Kilmeade tells it as well as any have. After the Philadelphia episode the American blockade continued with several notable actions on and from the sea, each with varying success until a peace of sorts was concluded, but included a huge leap in respect for American naval power throughout the world. 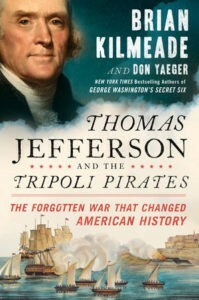 The major downside of Kilmeade’s effort is that he mistakenly lauds Thomas Jefferson and continually degrades John Adams’ regarding their respective contributions to the building up of an American Navy. This approach is at odds with most other histories of the era and is specifically contradictory to what has been written by David McCullough in John Adams and Ian Toll in Six Frigates. For a historian or a history buff this mistaken focus, unfortunately, detracts markedly from what otherwise would have been a fine book. Nevertheless, as a popular history of the beginnings of the United States Navy, it’s a good read. Vice Admiral Dunn is a former president of the Naval Historical Foundation. I agree with Admiral Dunn’s comment. Jefferson is famous for believing in a navy of gunboats and Adams was the champion of the navy. He also presents the religious conflict as the primary reason for the piracy of American vessels, when these pirates attacked anybody and had for years. This style of new history books are concerning. They are dramatic and fast reading, I worry that many will read only this book and settle on this in-accurate presentation of this era as the truth. Book details these states deserved in the end by 1830 to be colonized. There cruelty to non-Muslims and resorting to threats and bribes was bullying.